HOK, the General Services Administration and the University of Maryland recently partnered to write a comprehensive guide for sustainable development in the federal government. The work is being honored by the Federal Planning Division of the American Planning Association. The guide won the award because it was a part of the GSA Sustainable Development Education Initiative, which was selected as the “Winner” in the Outstanding Sustainable Planning, Design and Development Initiative Category. 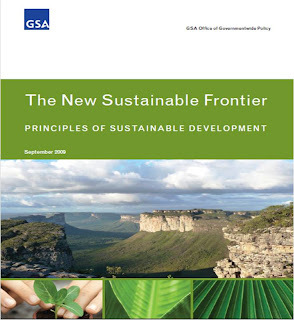 Titled “The New Sustainable Frontier – Principles of Sustainable Development,” the guide was published last summer by the Government Services Administration’s Office of Governmentwide Policy. The making of the guide was a fantastic learning experience for all… experts in Ecological Economics at the University of Maryland helped give a business context to the guide. Also, HOK facilitated a work session with several dozen key sustainability leaders across federal agencies and green companies from the corporate sector to understand unique organizational concerns. Jonathan Herz’s with the GSA led the team and his focus on making the guide “practical and usable” as well as “scientifically sound” produced excellent results. My favorite part of the guide? The end of the executive summary where the team structured a series of questions related to building buildings, buying products and procuring services. 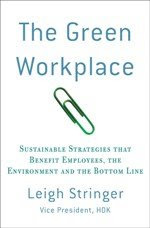 The questions are tools that federal employees should ask to green their daily operations. Here are a few of them. How can we support operations efficiently, and with just distribution of resources, while reducingthe Government’s ecological footprint? Are we using existing stocks? Can we use a service instead of owning this product?d. Can we reuse and an existing facility rather than building a new one? WHO MADE IT? Does its production and use allow all to live with respect? WHAT’S IN IT? Is there a third party assessment of contents available to help us makeinformed decisions, such as an Environmental Product Declaration (EPD)60 or ASTM International“Sustainability Assessment of Building Products”? HOW DOES ITS PRODUCTION AND USE AFFECT THE EARTH’S CRITICAL ECOSYSTEMS? WHERE DOES IT GO WHEN IT IS NO LONGER NEEDED? 3. SHARE THE GOVERNMENT’S VISION FOR SUSTAINABILITY WITH SUPPLIERS, AND FAVOR THOSE THAT SUPPORT THAT VISION.